Last month I started my round-up by stating that summer was well and truly with us, well what a transformation we’ve gone through in the last two weeks as unfortunately its now over and Autumn is bearing down. Its sad in a way but great news for the specialist angler as most species start feeding up knowing that winters not that far away and with the rivers having a bit of flow on them and often with colour, September can be a brilliant month but what happened to me in August. Well it’s been another busy month with 119 hours clocked up bankside from 19 sessions. These have been split between guiding (10) features (3) and sadly personal sessions down to just six. These sessions have seen me drift between the counties of Hampshire, Surrey, Berkshire, West Sussex, Kent and Herefordshire often settling on flowing water from the Loddon, Kennet, Thames, Wye and even the Hampshire Avon. Many of the guiding days have been for barbel yet one regular; Ron Jackson wanted to catch a big crucian and did this in style taking a number of fish to 3lb 6oz! The features this month have included a shoot at Newdigate Fisheries for Tight Lines where I landed a number of tench including my first golden one so a sort of personal best I suppose but not one I will be actively trying to beat. I’ve also been busy producing features for Anglers Mail one of which saw me targeting barbel on corn and another trying to catch a river carp where although I failed I did land a very special fish. Keep an eye out for these features as they will be appearing very soon. As for my personal sessions the most remarkable was a visit to the now famous Buckland Fishery in Kent where I managed to beat my long standing rudd personal best five times in a day but with so much written on the venue and with a separate blog posted a few weeks ago I’m not going to bore anyone with loads of images and stories of these very special fish. A session at Godalming Angling’s Enton resulted in a number of crucians gracing my net, the best 3lb 6oz and a few trips to the Thames in an attempt to catch a barbel saw just quality roach pick up my pellet hookbait. So what’s happening in September, well once again loads. The Wye will feature highly as will the Thames where I will be trying to catch my first barbel from the river as well as tapping into the perch and roach potential. A Nash Roadshow at Holme Grange in Berkshire on Saturday the 6th (please come along and say hello) will no doubt see loads of carp landed and towards the end of the month surprisingly catfish will feature. The urge for barbel comes early! It seems that the change in weather has spurred anglers into getting out on the river bank in search of a barbel or two. I don’t normally think about these until well into September but Autumn has arrived early, the rivers have had a good flush through and the barbel have responded. I been inundated with requests this month and have had to squeeze a few extra days in to accommodate these needs, something that has unfortunately resulted in myself getting out as much but work comes first. Obviously my local rivers, the Kennet and Loddon have featured yet the Wye has come into play earlier than normal and my own personal outings have seen me frequenting the mighty Thames on a few occasions, however the capture of a barbel has eluded me but its very early days still. At the start of the month the last of FAS barbel teach-ins took place on the Loddon and once again it was a successful evening with a couple of barbel and chub being landed. The Loddon continued to produce with one customer hooking four over two short evening sessions. The Kennet also played its part with Howard landing a fine specimen in daylight and as for the Wye; well for sheer numbers of barbel it just can’t be matched. The first session saw myself making the trip there and back in a day but my two customers were rewarded with arm aching action all day landing at least ten barbel each including the occasional lump. Paul and Ian also enjoyed the barbel fishing on the Wye and over the weekend session lost count of the amount of barbel they landed which included a fine brace by Ian in a new swim well upstream to where I normally guide. All in all a brilliant month for barbel and if August has been this good well what’s going to happen in September? Anyone wanting to experience the Wye can as I still have three spaces available on Monday Sept 15th and two on the 16th. Call me on 07928 617006 – 01252 315271 or email me duncancharman@me.com if you are interested. The smile says it all, a very special fish for me and my first from the beautiful Hampshire Avon. Certainly not the biggest chub I’ve caught and not on my preferred method, the float but they all count and don’t have to be personal bests to be special. Thanks to Roy Westwood for his help in location and making the morning special and looking forward to a trip later in the year for some proper traditional chub fishing. Ian Joyce caught this cracking barbel whilst trying a new swim on the famous Aramstone stretch of the river Wye. It was one of a numerous barbel that he and his mate Paul caught whilst feeder fishing pellet under my guidance. Personal best Golden Orfe – 4lb 10oz. Dates become available for the river Wye - Act now! Dates become available for the Wye – Act now! Due to a late cancellation, guided fishing days on Monday the 1st and 15th of September have become available to fish the fabulous river Wye and with the Whirlihole booked barbel are guaranteed! So anyone wishing to fish two days on the trot is now in luck as I still have the odd space on Tuesday Sept 2nd and 16th. Just this week a couple of anglers enjoyed non-stop action in this swim taking around twenty barbel between them. If you are interested then the cost per day, per angler is £125 which includes the cost of booking the venue, bait and terminal tackle, coffee all day and images of your catch plus my company and advise all day! Monday September the 1st, Tuesday 2nd, Monday 15th and Tuesday 16th. Two customers enjoyed a hectic day this week on the river Wye at Hoarwithy. Meeting at 7.30am on a slightly chillier August morning than expected both Marcus and Jamie cast feeders filled with Nash sticky pellets and used drilled 8mm pellets on the hook to take at least ten barbel each including a couple of whackers pictured. The cold night obviously made a difference as the fishing was tough to start with but constant casting eventually got the fish into the swim with both anglers bent into barbel at the same time on occasions. If you fancy a day like this then send me an email as I actually drove up and back in a day, tiring but possible and I’m happy to do this for two or more anglers. I also spend the best part of two weeks in September on this magical river one of which produced exactly 100 barbel to my clients last year and still have a few spaces available so email me duncancharman@me.com and I will forward what dates are still free. Charman’s Challenge – Buckland Lake Fishery. Buckland Lake Fishery, Buckland Road, Cliffe, Nr Rochester Kent ME3 7RT. Day Tickets – Main lake by appointment only £40 per 24hrs also Syndicated at £500 per year which is now FULL (names can be placed on a waiting list). Two coarse lakes, Specimen Lake cost £15 for 10hrs, £18 all day, £20 overnight and £28 for 24hrs and the Coarse Lake costs £10 for 2 rods and concessions apply on this lake only. 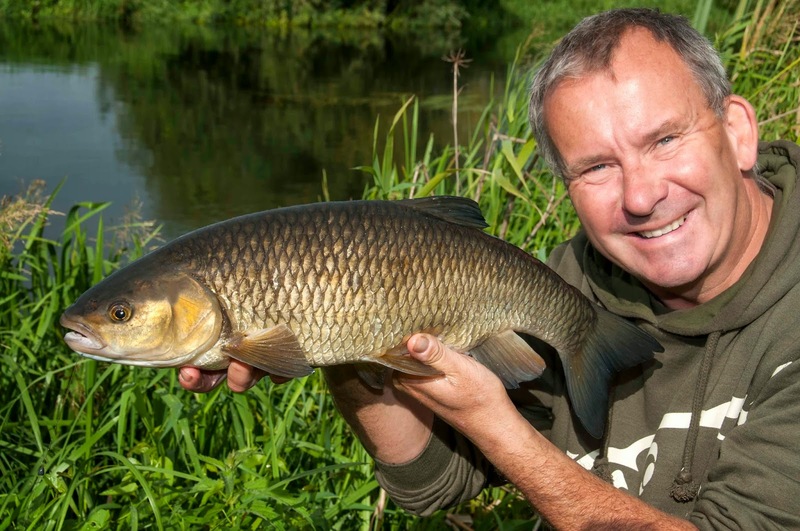 Stock – Main lake rudd to 4lb plus roach, perch, pike and carp to unknown quantity. Specimen lake offers carp to 30lb. Coarse Lake offers plenty of carp, tench, perch and pike plus rudd to well over 3lb and there is a trout lake containing brown and rainbow trout to over 12lb. Conditions – With storm Bertha hitting the south east it was never going to be easy but it actually worked in my favour. Warm humid with heavy downpours and thunder and lightning and the wind off my back, a south west. Every now and again someone does the honourable thing and this time it was my good friend Fred Healy who after discovering a rudd goldmine, and knowing my love for the species called to tell me to get my arse down to Kent. Now I have to admit that although I love catching big fish but travelling all over the country just isn’t my thing yet when he asked what my personal best was and I told him it was 3lb 5oz his reply really started to get my mind working as his answer was, well your beat that easily! I nearly dismissed the information as I had a full weeks work but knowing that its whereabouts would soon be out to the angling world and that it was also fast growing interest to be syndicated I just had to cancel an appointment and as Fred said, get my arse down there! To be honest I rarely travel more than an hour to a venue and my first thoughts were that Cliffe in Kent was about 2hrs away, yet a quick postcode tap into the satnav showed just 70mins, so my mind was made and the car loaded. A quick look at the weather showed an awful weather front moving in, storm Bertha it was called and its was going to hit worse, yes you’ve guessed it in Kent. Fred had informed me that he had been catching on the float yet I needed plan B up my sleeve and decided to take a couple of 1.25lb t/c rods with helicopter rigs set up as I knew that sometime during the day these would be called for. The alarm sounded at 3am and I was on the road by four arriving well in time for the 6am opening. Five pints of red maggots wriggled in a bait bucket but little did I know that these would only be used a feed as the hoards of small rudd made using them on the hook impossible. Luckily Scott the onsite manger has a small tackle shop on site and I was able to grab four tins of corn yet after a quick look at the swims and an hour fishing the float all I had to show for my efforts was one tiny rudd. Scott had told me to keep my eyes pealed and move if I saw rudd and after an hour I did just that as the odd rudd could be seen to my right. The problem I was faced with was that the rudd were moving some way out and I just couldn’t see them being caught as I had been told they do in the margins. The reason for this was obvious as the wind was coming from behind and the rudd weren’t confident coming in close on it. In all honesty I felt I was in the worst place possible but with limited swims had to continue yet the odd big rudd rolling kept up my confident. Another hour on the float three rod lengths out proved unsuccessful, not that surprising seems it was over 20ft deep and all I could do was fish at a maximum depth of 12ft. Then it happened the clouds darkened and the heavens opened as well as the wind swinging momentarily 180 degrees. Time for the feeders and batten down the hatches. A simple underarm cast saw the feeder landing where I had been feeding and with a maggot feeder and a helicopter rig with a piece of normal corn popped up with some yellow foam slowly descending I expected to sit out the storm. How wrong was I as on the way down I felt a tap, then a pull and played in a rudd weighing 2lb 9oz. This was followed by more, five in fact all over 2lb 7oz and two in excess of 3lb, one bang on the money and another of 3lb 4oz. With rudd it’s often a case of stop feeding stop catching and by permission from Scott a keepnet was employed just for such an occasion which prolonged the feeding spell without any detrimental effect to the rudd. When the bites dried up and the weather improved I quickly weighed and photographed the catch before resuming feeding. Although happy with the mornings result I was kicking myself as I lost far more big rudd than those landed. The problem was a dense weed bed around a rod length out, well out of sight and one that saw my line bedding down in when the line was tightened against the feeder, something that’s paramount in the effectiveness of the heli-rig. If the rudd didn’t shed the hook then the hooklink would part so after collecting my thoughts I rigged up with a 6lb12oz hooklink, size 12 hook and swapped the corn for a 10mm Nash Airball Pineapple Pop-up. The afternoon started on a more positive note with nine of the next ten rudd landed with a couple coming to the float. This pop-up tactic also accounted for a much better stamp of fish and although only one was quickly weighed which set a new personal best of 3lb 6oz I never knew until the shoal moved on exactly what I had in the keepnet. Weighing the rudd they weighed in at 3lb 1oz, 3lb 8oz, 3lb 9oz 8drams, 3lb 10oz and 3lb 12oz 8drams, truly remarkable. The lake is classified as a Quarry and there are no proper swims created at the moment as it’s rarely been fished before and all you do is make yourself as comfortable as possible. Unfortunately with the rain falling the banks become lethal and I slipped at around 3pm coming down heavily on my knee cap which by 6pm had ceased completely. What I could have achieved if this hadn’t happened is mind-blowing and the drive home was certainly not one I wish to remember. Passing my results on to my mate Chris he headed down the following day and although the fishing wasn’t as good he still managed five rudd over 2lb 6oz with the best two weighing 2lb 15oz and 3lb 6oz! Fortunately I managed to get my name on the waiting list, at the top in fact and Chris is second so cant wait for a place to become available yet I’m not expecting any of the lucky twelve to opt out for a while. Good luck lads go fill your boots! The third and final FAS barbel teach-in took place on Thursday August 7th. The weather was warm and sunny and the river was low and clear so the fishing was never going to be easy and coupled with this an angler had once again failed to read their permit and was moving around the river disturbing what should have been a period for the fish to settle. This problem seems to be because some anglers are struggling to lift the gate in the car park and parking in the lay-by so are missing the sign when these teach-ins are on. Its an annoying situation that seems to be reoccurring each season, so l urge every member that fishes the stretch to check their permits before heading to the river. After the standard tackle, rig and bait explanation we all headed to the river bank withy each of the six anglers choosing a swim. Normally when the river has had time to settle there is a flurry of action soon after casting in yet as expected this wasn’t the case on this occasion and the first barbel, one weighing 6lb taken by Steve came after more than an hour. Steve son Chris wasn’t to be outdone and just as the light was fading called in a barbel of around six and a half pound from a swim far down the river but one that has been producing well this year. Leaving the river once the light had gone saw all anglers staying on with Chris informing me that he took a couple of chub, one weighing a creditable 5lb 2oz. It was noticeable how the river came alive at dusk with plenty of fish moving and I’m sure a few more fish were taken later that evening. All in all these three teach-ins have been extremely successful with every angler turning up so the change in the booking system has certainly worked. Apologise to any angler that missed out but these events are very popular and places need to be booked as soon as the dates are published in next years permit. Thanks to everyone who sent in their kind words and appreciation of my time given as it this that makes it all worthwhile. Tight lines and keep me informed on how things go!